A growing number of communities across the country now have complete streets policies — somewhere in the neighborhood of 280, if you want to get specific. But now comes the hard part: implementing those policies on real streets. Complete streets policies represent a complete 180 from the way transportation planning has been done in 99 percent of communities for the past, oh, six decades. Former New Jersey DOT executive Gary Toth, now of Project for Public Spaces, was in Cleveland last week to help local engineers and construction managers understand exactly what the city’s new complete streets policy means. The new reality, says Toth, will ask traffic engineers to consider ‘quality of place’ and to remove the blinders on such context sensitive issues as how is land being used. 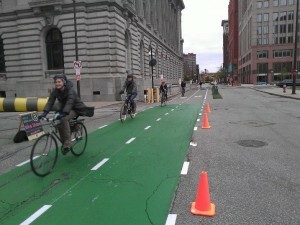 Cities like Cleveland are discovering that they can create more value in this tumultuous funding landscape, he assured, when items like bike lanes are baked in to the design. Engineers have a key role to play in leading the charge. Done right, complete streets can be good for cars, too. Toth spent the better part of his career making the case for more highways and wider roads as an engineer for the New Jersey Department of Transportation until his revelation that ‘context’ and ‘quality of place’ don’t have to be pitted against the flow of motor vehicles. Now, he helps cities design and use ‘multi-modal’ guidelines. He helps engineers gain the confidence to challenge assumptions that might work at odds with the new emphasis on vibrant places. For example, most engineers are padding in more ‘design speed’ which leads to wider roads even though street design standards already have a margin of error. Elsewhere on the Network today: The FABB Blog peeks in on London, where some 10,000 gathered in the streets over the weekend to demonstrate for safer cycling conditions. Charleston Moves shares the disappointing news that leaders there are considering a skateboarding ban in many parts of the city. And Mobilizing the Region reports that complete streets policies are sweeping across the meadowlands of New Jersey.